Partial and complete loss of teeth is one of the most common abnormalities of the dentomaxillary system, especially in the elderly. The current conventional method for replacing defects in the dentition using traditional methods of prosthetics such as making partial and complete removable dentures are not always satisfactory to patients. From this point of view, it is advantageous to make orthopaedic structures supported by the dental implants. Very often the loss of teeth is followed by the atrophy of the alveolar ridges and complex anatomical and topographical conditions, which makes inserting the dental implants quite a difficult problem. 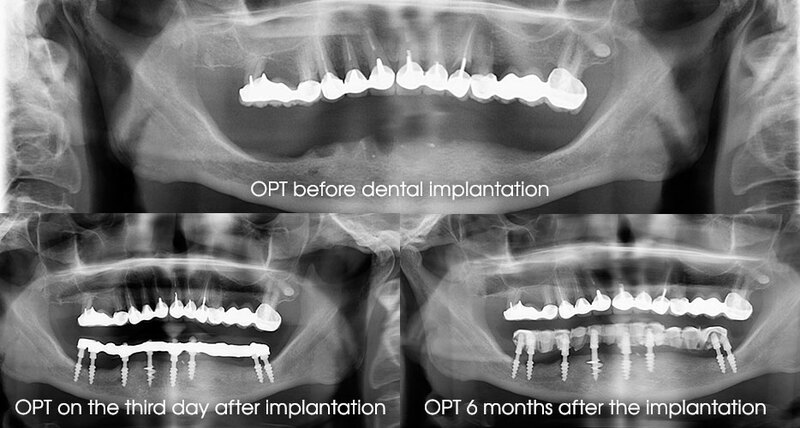 Recent publications featured data on the successful functioning of the immediately loaded and functioning implants in patients with toothless jaws. The immediate implantation implies joining two surgical steps into one — dental removal and implant insertion which are conducted simultaneously and thus prevent alveolar resorption. Immediate implantation compensates negative psychological effect due to dental removal for the patient, especially if those are the last teeth in the denture. Furthermore, the patient may start using the dental prostheses at once instead of the prolonged period between the removal and the insertion of traditional implants. It also reduces the number of visits and the treatment costs. As of now, there is no unanimous opinion or a certified clinical protocol which determines the length or the diameter of the implant to substitute a tooth. Frequently enough the atrophy of the alveolar ridge causes problems in inserting the implants due to thin alveolar crest or closely situated anatomic structures i.e. the lower alveolar nerve. Impairing the functions of the nerve may occur at the direct perforation of the canal and trauma while forming the implant bearing area as well as due to compression of the nerve with the post-operational swelling or dental implant. These complications result in loss or long-term change of sensitivity in the innervation area, pain syndrome of various intensity along with the emotional stress disorders and considerable impairing of the patient’s life quality. 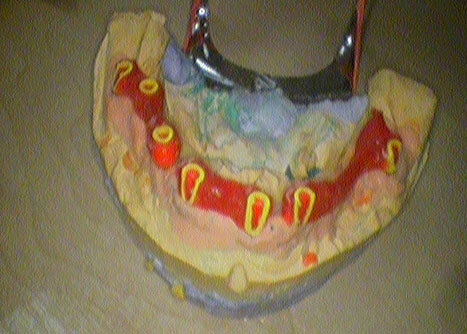 Only detailed planning of the surgery along with computer tomography and surgical template preparation can ensure that no complications will take place during the surgery in case of inserting the dental implants into the side area bypassing the mandibular nerve while the detailed planning of the orthopaedic step will ensure reliable functioning of the orthopaedic construction. The high percentage of the complications in dental implantation in the mandible with complex anatomical and topographical conditions aimed at permanent orthopaedic construction manufacture indicates the lack of knowledge on the issue and the results of research do not have the general evaluation. Thus, the object of our research is to rehabilitate a female patient with complex anatomical and topographical conditions in the toothless mandible by using the proposed algorithm of surgical dental implantation with immediate occlusal loading, which allows for high precision in preparing the implants before insertion, manufacturing precise prosthetic construction with high adherence of the supporting area to the suprastructure of the implants and to shorten the manufacturing procedure for the temporary prosthetic construction of the dental prosthesis to one day. The patient S., born in 1960, turned to the clinic with complaints of the absence of teeth in the mandible in order to install permanent orthopaedic construction supported by implants. The anamnesis of the patient described long-term use of removable partial prosthesis. The opposing jaw has permanent metal ceramic bridge prostheses supported by the teeth 16, 14, 13, 12, 11, 21, 22, 23, 24 and 27. In order to determine the possibility of manufacturing permanent orthopaedic construction supported by the dental implants, a computer tomography has been conducted (Fig.1). The examination proved that the patient has bone tissue of type I according to the Lekholm and Zarb classification. The side areas where the implants were inserted the alveolar crest was 10,63 mm in width and 12,60 mm in height. The distance between the cortical plate and the mandibular canal was only 4,84 mm. It has been decided to manufacture the permanent orthopaedic construction supported by 8 implants. 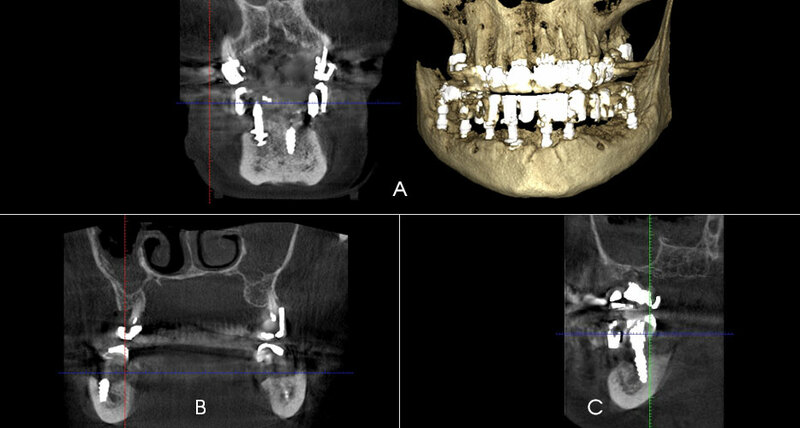 In this medical case inserting the implants in the side area bypassing the mandibular canal was only possible after conducting the computer tomography in order to pinpoint the placement of the canal and consequent surgical navigation template preparation. 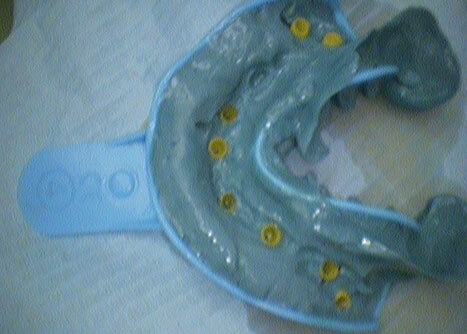 The dental implantation surgery was planned virtually in the DDS-Pro programme using the computer tomography results, model scans and wax-up. Screw-retained one-step implants with cortical fixation were installed in the distal area of the mandible while direct implantation of the root-like implants with screw-retained intrabone part in accordance with the standard procedure was used for the front area. The length of all the intrabone parts of the implants is 10 mm, the width is 3,0 mm. After inserting the implants, a computer tomography was done in order to ensure the correct placement of the implants (Fig.2 and Fig.3). The effectiveness of the treatment was measured by the clinical and roentgenologic criteria (Albrektsson and coll). The post-surgery period did not show any complications, the state of the mucosal lining was satisfactory. The patient did not express any complaints. The patient was clinically checked for implant immobility, absence of negative effects on percussion, absence of pain syndrome around the implants and absence of paresthesia. Fig. 4. Clinical presentation of the oral cavity on the second day after implantation. Fig. 4.1. 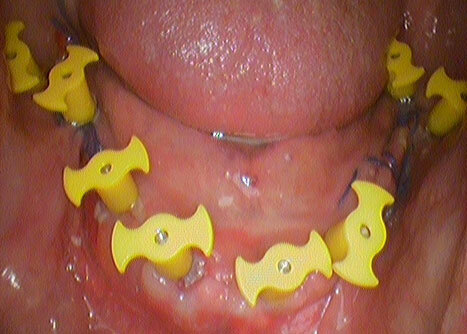 Immediate prosthetics with fixed metal plastic constructions on the third day after the surgery. The conducted surgical step of the dental implantation implied immediate functional loading with the temporary fixed combined prosthesis with plastic coating which the patient was able to use on the third day after the conducted surgery. The manufacture of the temporary combined prosthesis was done in accordance with the high quality and precision method of the occlusal adaptation of the implant suprastructures proposed by us and suitable for the patient, which allowed for considerable shortening of the temporary prosthetic construction manufacture procedure. To mitigate the divergence and convergence of the implant suprastructures against the prosthetic area and against each other adaptive parallelometric keys were used. In conducting the orthopaedic step we procured working impressions by using plastic transfers into which implant analogues were installed, followed by moulding the master cast. After moulding the master cast, we conducted the parallelometry with the implant analogues, fixed the lab caps which served as adaptive parallelometric keys onto the implant analogues, dissected the caps according to the method of the construction installation and interjoined them with the dental resin. Next the temporary orthopaedic construction with adaptive keys to be positioned onto the implants was manufactured. We further carried out the dissection of the implant suprastructure, which is an indivisible part of the implant itself, in the cavity according to the keys and the prosthetic construction installation method. Dissecting the implant suprastructure according to the keys allowed for the mitigation of the convergence and divergence of the implant suprastructure and creating the 100% match to the prosthetic construction. The sufficient number of implants of considerable length, practical compliance of the axes of the prosthesis and the implants eliminates such risks as reduction of prosthesis retention reliability, fractures of the implant and inadequate functional loading on the implant. Using the roentgenology throughout the monitoring of the patient, it was determined that the bone tissue resorption area is absent around the intrabone part of the implant and that the loss of bone tissue during the period of the implant functioning remains minimal. Fig. 10. Roentgenology before and on the fixed dates after the dental implantation. Similar data was obtained in the computer tomography after 6 months (Fig.11). After 6 months of using the temporary construction the patient did not express any complaints, therefore, the temporary construction was substituted with the permanent which was fixed in the oral cavity. (Fig.12) The material for the permanent prosthesis is High Performance Polymer (Bio HPP) due to its bio-compatibility, similarity to the mechanic properties of the bone skeleton, considerable durability, optimal polishing and low susceptibility to dental calculus. Thus, the detailed planning of the surgery along with computer tomography ensured no complications of the dental implantation and the detailed planning of the orthopaedic step virtually eliminated such risks as reduction of prosthesis retention reliability, fractures of the implant and inadequate functional loading on the implant. Such low-invasion method may be used for patients who wish to lessen the number of surgeries and visits to the dentists as well as the duration of the treatment with the possibility to use fixed orthopaedic construction immediately after the insertion of the dental implants. Malanchuk V. A. Immediate Dental Implantation / V. A. Malanchuk, E. A. Mammadov // Scientific and Academic Publication for Students and Doctors. – Kyiv, 2008. – 154 p.
Frank Renoir. Risk Factors in Dental Implantology / Renoir Frank, Rangert Bo // Moscow – 2004, 182 p.
Hegedus F. Trigeminal Nerve Injuries after Mandibular Implant Placement – Practical Knowledge for Clinicists / F. Hegedus, R. Diecidue // Int. J. Oral Maxillofae Implants. – 2006. – N. 21 (1). – P. 111 – 116. Doroshenko O. M. Clinical Evaluation of the Effectiveness of Replacing Defects in the Dentition with the Orthopaedic Constructions Supported by the Implants Depending on the Term of Recovery of Occlusal Loading / O. M. Doroshenko O. F. Sirenko, M. V. Doroshenko, M. O. Pavlenko // Modern Dentology. – No. 3 (77). – P. 98 – 101. Doroshenko O. M. Clinical Evaluation of the Effectiveness of Replacing Defects in the Dentition with the Orthopaedic Constructions Supported by the Implants with Individual Abutment / O. M. Doroshenko O. F. Sirenko, M. V. Doroshenko // Collection of Research Papers of the Shupyk National Medical Academy of Postgraduate Education. – Issue 23. Book 1. – 2014. P. 346 – 356.